Don’t miss the chance to take a must-do overnight cruise on Milford Sound aboard the ‘Milford Mariner,’ with round-trip transport from Te Anau by luxury coach. 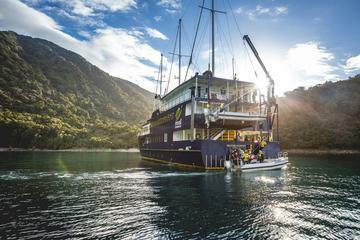 Cruise the entire length of the impressive fiord, passing towering cliffs like Mitre Peak en route to the Tasman Sea. Then anchor for the night in sheltered Harrison Cove, where a nature guide on board helps you make use of provided kayaks to explore. Select a private single or twin-share ensuite cabin, including a 3-course buffet dinner and breakfast. Board your luxury coach upon hotel pickup in Te Anau to Milford Sound. Your driver-guide provides interesting commentary on the sights during the scenic drive along Milford Road in the UNESCO-listed Fiordland National Park. Enjoy rest breaks and brief walks with plenty of photo ops during the journey. Your Milford Sound overnight cruise begins aboard the Milford Mariner cruise vessel, which travels the full length of the fiord to the Tasman Sea. Meet your nature guide on board and check out key natural landmarks such as postcard-perfect Mitre Peak, a snow-capped pinnacle that reaches up 5,551 feet (1,692 meters) from the glass-like water. Throughout the Milford Sound cruise, you’ll pass by waterfalls, rainforest-clad mountains and marine life such as bottlenose dolphins, New Zealand fur seals and the rare Fiordland penguin. Upon reaching the open sea, your captain hoists the sails, subject to favorable weather conditions. The vessel returns to and anchors overnight in sheltered Harrison Cove. Here, enjoy a level of activity or leisure that suits your interests. With a guide on hand, take the tender craft or a kayak to explore the shoreline, or just relax in the observation lounge or the large, open deck. After the day’s events, indulge in a 3-course buffet in the spacious dining saloon before retiring to your private ensuite cabin. Beverages are sold at the licensed bar on board. Following a hearty cooked breakfast the next morning, enjoy more cruising before the Milford Mariner returns to the Milford Sound Wharf, and return to your Te Anau hotel by coach. Vessel information: The cruise has spacious viewing decks, dining saloon, fully licensed bar and observation lounge. Need to bring: Non-slip shoes/ boots, waterproof jacket, warm sweater/fleece jacket, sunscreen/sunglasses, insect repellent, swimwear (optional), camera, cash for bar and snacks. Overnight bag only required.